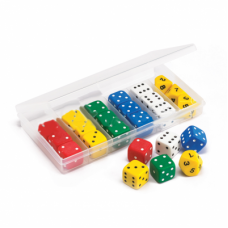 These large dice are ideal for young children. Set includes 20 x 25mm dot dice in 5 colors, and 4 x 10-sided dice in 1 color. 24pcs in sturdy plastic container.